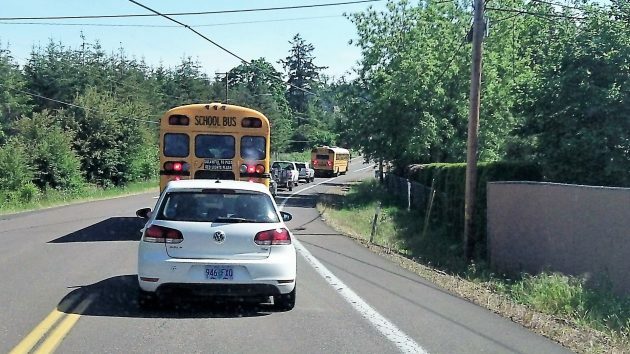 Stuck behind school buses on Scenic Drive in North Albany last spring. At the start of another school bus season, how about a small plea, self-serving though it may appear? Hey kids, try to show a little hustle when you’re getting on and off the bus. We’re all familiar with the traffic law on school buses, and a sensible one it is: No passing, in either direction, of a school bus that it loading or disgorging children. Now and then some heedless but potentially murderous motorist violates the law and blows past a stopped bus. Those drivers are a menace, and if they can be identified, they should be charged and called to account. So from shortly after Labor Day through the middle of the following June, most of us obediently trail those yellow buses as they make their stops every two or three blocks on our two-lane roads. And when you made the mistake of cutting it close with your schedule, don’t be surprised if your fingers start drumming on the steering wheel. That’s when it seems that kids sure take their time as they get on the bus, find a seat and sit down. ABC News had a story last night about how common it is, across America, of people who ignore the bus stop signs and flashing lights. In the multiple millions each year, with numerous injuries to children. Schools are now installing cameras to capture license plates of offenders. I agree with Jim here. Haste and hustle increase the risk of accidents in all aspects of life, including kids hurrying to get on a bus and not paying attention to traffic. I still recall the West Albany high school girl who was killed my wife’s senior year in high school (back in ’84 or ’85) — hit by a car as she went to board the school bus. Having ridden the school bus for 12 years of school back in the day, I too have noticed this phenomenon. Watching the kids get off, they dribble out in ones and twos with what seems to be an interminable time between. I’ve often speculated on the cause, with my principal conjecture being that first, all the little snowflakes each thinks they are “special” and have no need to consider the effect of their actions on others. Second, the poor little devils are each carrying a 30-pound backpack they have to retrieve, hoist onto their back, and then proceed slowly down a narrow aisle and stumble down a set of steep steps. I presume the reverse is true in getting on the bus. I further suspect that bus drivers today take the precaution of waiting till all children are safely seated before moving. Of course, back in the day, the driver gave you a few seconds and then hit the gas, a great motivator to move along quickly. Ah well, it’s a wonder any of us survived; but then we didn’t live in a time when any little disturbance was someone else’s fault and cause for legal redress. A lot of the slow moving behavior probably stems from slow moving parents. Swift action on sitting and or departing is something that needs to be forethought. It is a kind of thought to action: respect your environment, yourself and your neighbors strategy. I would gladly wait as long as kids want, ten times a day, on my bike and when I rarely drive, in exchange for never again hearing a non-emergency car horn. This is one of the most minor inconveniences we have to bear in life. They are kids, and we expect them to act like kids. We are adults, and we should act like adults. Oh, get over yourself. I’d rather wait than have some little first-grader get run over by the bus because he slipped under it because someone was pushing him to hurry. This posting and following comment section reminds me of a group of old men sitting in a diner with not much to talk about. It is a good reminder however to drive slow in school zones. Especially these Sept. days as the law enforcement will be watching. What do you have for us next HH? I’m just surprised they aren’t using those new turnouts for bus stops that they installed with the new sidewalks on Gibson Hill. But seriously, it does get frustrating when the same bus stops every two blocks. Can’t kids be expected to walk a couple of blocks to eliminate 1/2 of the mobile stop signs in the morning? Am I being a jerk for disrespecting children?